HOST 2013 - Marco Beverage Systems Ltd.
Marco will be exhibiting at HOST once again this year. HOST is the single biggest hospitality and catering exhibition in the world. It attracts professionals from across the spectrum of the Hotel, Restaurant, Catering, Coffee and Tea worlds. This will be our 4th year exhibiting at the vast show which stretches across 10 pavilions and halls. Our stand will feature our full range of coffee brewers and water boilers including the ever popular above counter and undercounter Ecoboiler and Ecosmart ranges. 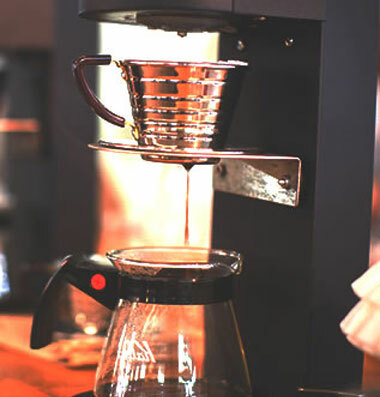 The BRU will garner much of the attention once again as it’s our latest gold standard pour and serve coffee brewer. However, we will also be launching JET at HOST which is a coffee brewer like no other. David Walsh will be blogging about it soon but you can come and see it for yourself on Marco’s stand at F35, pavilion 9. Throughout the show we will have superstar baristas giving presentations and cuppings. Anne Lunnel from Koppi Coffee will be doing two cuppings a day at 10am and 2pm on the 18th and 19th and again at 10am on the 20th and 22nd. She will be showcasing her entire range of coffee throughout the week and will also be on our innovation bar throughout the show which will feature our latest concepts which, once again, David Walsh will be blogging about. Ben Kaminsky will be joining us at 4pm between the 18th and the 20th. Ben will be presenting a fantastic brewing/extraction workshop using our innovation bar and will be giving a presentation on the same using our built in plasma screen on site. Last but certainly not least we have Morten Wennersgaard from Nordic Approach giving a cupping featuring all the new and current coffees in their repertoire on the 20th and the 21st at 4pm while he will also be presenting a special on Ethiopian coffees at 10am on the 21st. Representatives from our UK, Ireland, Europe and Middle East offices will be on stand to handle your queries along with David Walsh from our R&D team. Drewry Pearson (MD of Marco and President of the SCAE) and Paul Stack (Operations director of Marco and Chairman of the SCAE education committee) will both be in attendance on our stand so feel free to swing by and have a coffee with us. Speaking of coffee… We will be featuring coffee from Koppi, Nordic Approach, Square Mile, Tim Wendelboe, Counter Culture and Intelligentsia along with teas from Althouse so we will be able to cater to every taste. Come visit us on stand F35, Pavilion 9 and say hi.